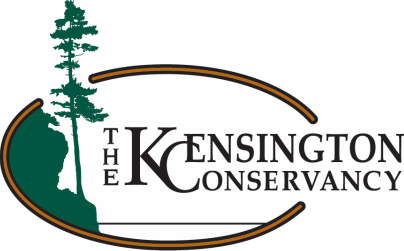 August 8, 2016 - The Kensington Conservancy, a local land trust, is proud to have celebrated their 10th anniversary as a registered charity in Canada. The traditional 10th anniversary gift is tin, however, the Kensington Conservancy received the gift of a 10th anniversary gala on July 31st from a donor who wishes to remain anonymous. Almost 300 people enjoyed a celebration that allowed 100% of the ticket sales to go back to the charity. The Johnson Township Community Centre in Desbarats was transformed into an "enchanted forest” for the occasion. Live music was perform by the Ross Phillips Band, followed by a fantastic meal catered by Grand Gardens and entertainment from Sault Ste. Marie's own Tim Murphy, who performed as Joan Rivers. After dinner, Hugh MacDonald, the vice president of the Kensington Conservancy, introduced the evening with a welcome from the board of directors. He introduced Tanna Elliott, Executive Director whom has been with the organization since 2006. Peter Welles, outgoing president likened the gathering to not just look at the tall trees that make up the multi generations whom enjoy the area, but also the families whose deep roots hold it together. The incoming president, David Hofmann, presented Welles with a gift from all those present and thanked him for his tremendous work over the past 10 years. Welles, in 2014, was recognized by the Ontario Land Trust Alliance for his international work that has strengthened the movement here in Canada with a visionary award. President Hofmann hinted at some amazing projects that are currently in the works that will move the conservancy's second ten years in a positive direction. The Kensington Conservancy is working to protect our precious lands and waters in perpetuity through voluntary conservation agreements and property procurement. Embracing good stewardship practices, the conservancy works with the local community to develop programs that will promote greener and less intensive development, perform the best land and water management practices, control invasive species management and encourage low impact recreational activities.